I'm a mom raising my own children to volunteer in the community frequently -- my hubbie, kids and I each donate more than 75 hours per year to various causes. 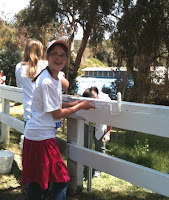 Pictured here are my girls painting the barn fence at historical Will Rogers State Park in California last month. This was the most recent community service project, a Big Sunday event, that we participated in as a family. In fact, our family has volunteered for Big Sunday since our youngest (triplets) were just two years old. So, whenever I hear about programs such as this I'm always glad to pass on information to this blog's readers about organizations such as Kids Who Give which is currently holding a competition to recognize children who are donating their time to make this a better world. 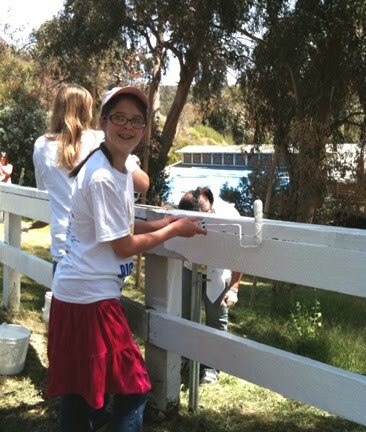 Kids Who Give will select 5 community-minded kids, ages 7-17. Each winner will be honored with $1000 to be contributed to the cause of their choice. Hurry, deadline to enter is June 15, 2010. See contest rules and complete this entry form to nominate a deserving boy or girl. Kids Who Give is a national program created by Farm Rich, the frozen snacks and appetizers company, to recognize kids who give back to those in need and to also educate other interested kids on how to start giving back in their own communities.